Clean Fresh provides professional and affordable cleaning services for a range of needs in and around the whole of North Wales. As a family business, we have built a successful business through word of mouth and are strong believers that if our customers are happy with what we do there will be more work and referrals to follow. For this reason you can be sure you’ll be getting the best service available. 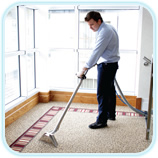 We service the whole of North Wales and have been providing professional cleaning services for over 20 years.